The original link is no longer available but WeChat pieces often focus on specific aspects of Tibetan culture and are generally popular, such as this piece about the “Chemar” offered at Tibetan New Year. Our thanks to Bhuchung D. Sonam for this translation, the annotated graphic and the additional notes. 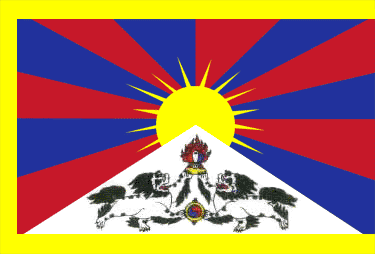 During the time of Ngari (Western Tibet) Chogyal (religious kings) i.e. before the 17th century, the instrument [Dranyen] used to be called Goepo or ‘vulture’. Even today there are places in Tsada Dzong (district) in Ngari where the local people still refer to the instrument as Goepo. In Ngari, Shigatse, Dhingri, Kongpo and many other regions there is a uniformed tuning of Dranyen. This style of tuning is called sagdrig literally meaning ‘quick arrangement’. Dranyen is widely played in most Himalayan regions, including Ladakh, Bhutan and Sikkim, where though the physical shape may vary but the tuning is basically that of sagdrig. In Amdo, northeastern Tibet, there is a culture of making Dranyen with dragon-shaped head [contrary to a horse-head which is popular in other parts of Tibet]. Apart from sagdrig, there is also an alternative tuning for Dranyen in Amdo. Dranyen in Utsang, or Central Tibet, became popular during the time of Desi Sangye Gyatso (1653–1705). 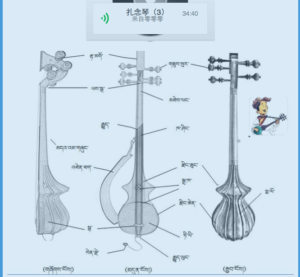 The instrument became particularly fashionable in Lhasa, Tibet’s capital city, most likely due to the influence of Nangma1 and the tuning of Dranyen here is called kyudrig or ‘standard tuning’. 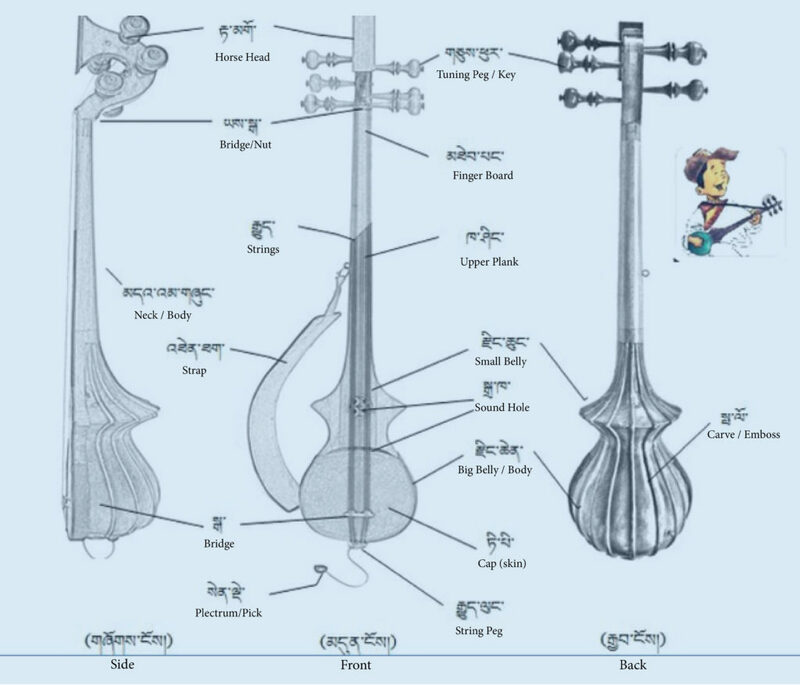 The seven-stringed Dranyen that was initially used in Gar2 dance has a different tuning, which includes notes from both sagdrik and kyudrig. Later the famous Garpon Pasang Dhondup3 replaced the seven-stringed Dranyen used in Gar with a regular six-stringed one. 1 Nangma is a genre of Tibetan music, which became very popular in the seventeenth century in central Tibet with the formation of Nangma Kyiduk or Groups, and became the court music to be played and performed for the Dalai Lamas and high Tibetan officials in the inner courtyards and hence it is called Nangma – Nang meaning the inner or inside. Many believe Nangma is derived from the Persian term Naghma meaning melody or music. However, two of the foremost authorities on traditional Tibetan music Dumkhang Phuntsok Namgyal and the late Maja Tsewang Gyurmey have commented that this is not true and that Nangma originated in the nomadic communities in Western Tibet. There were indeed Kashmiri merchants living in Lhasa who loved to play music and would often say, ‘Let’s play a Naghma.’ During the time of the 5th Dalai Lama (1617-1682), Muslims were granted land, which allowed them practice their culture, and they loved music. Some of the famous Nangma music players in Lhasa were hence Muslims such as Bai Wolila, Isbula, Hamai Ri and others. 2 Gar, literally meaning ‘an emanation’; ‘encampment of an army’ or ‘a dance’ is a genre of dance performance in Tibet that has a long history. It is particularly well known in Chamdo, Lithang, Shigatse, Ngari and other regions in Tibet where it is performed differently. In the seventeenth century, Desi Sangye Gyatso gathered many music scholars from Ngari, Ladakh and other areas for a conference and based on their reports and inputs compiled Chi-kyi Gyalmoi Luyang, which contains about 80 popular gars with their lyrics and musical notations. 3 Garpon (Master of Gar) Pasang Dhondup, a Professor of Music at Tibet University in Lhasa, traced a copy of Desi Sangye Gyatso’s famous Chi-kyi Gyalmoi Luyang – which disappeared from Tibet in the total chaos and mad destruction of the Cultural Revolution (1966-76) – in Ladakh when he travelled there for a holiday in 1990. Garpon then gave a copy to the Tibet People’s Publishing House, which published it in a book form the same year.